Passports are fun. Our kids had traveler’s passports and National Parks program passports and the novelty of filling them with stamps and stickers never grew old. I’ve also given children and youth pretend passports to help get them excited about special events, steps for completing a project or as a way to collect memories. 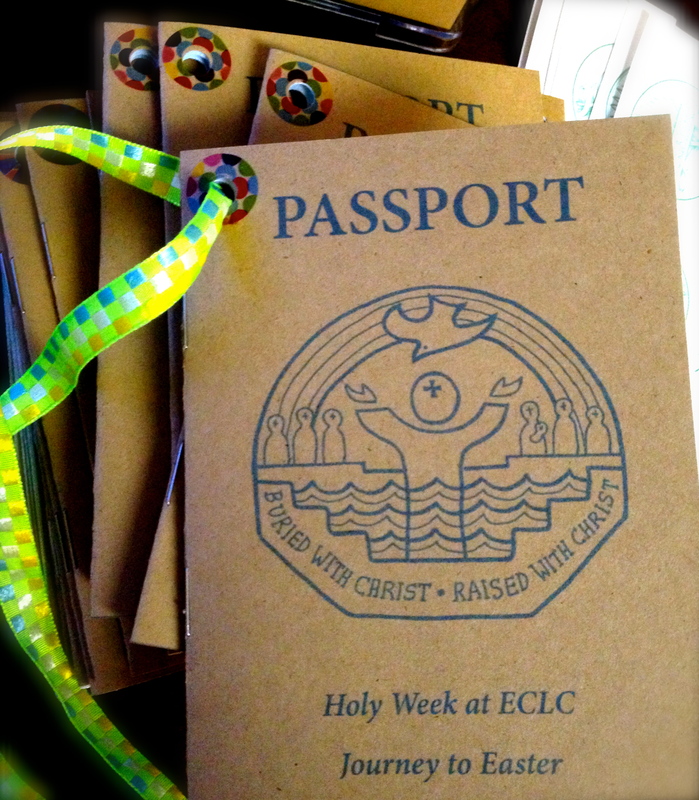 Inspired by Carolyn’s blog and Worshiping With Children Facebook page, along with a suggestion from one of the pastors, this year I created a Holy Week Passport, inviting kids and families to participate in all of the Holy Week experience. 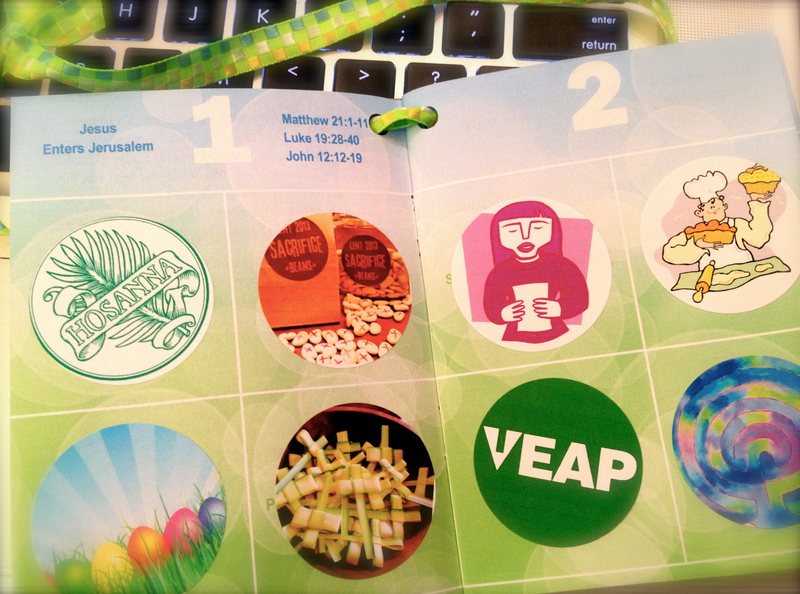 ECLC’s Holy Week Passport includes scripture references for each of the special days, and since our worship services are uniquely designed to be interactive and child-friendly, the stickers will actually mean something. The 8-page passports were so popular at the Palm Sunday Fair we nearly ran out of books and Polaroid film for the photos, even during spring break. My real hope, of course, is that the passport stickers at the Maundy Thursday, Good Friday, Saturday Easter Vigil and Easter Sunday services are equally as popular. 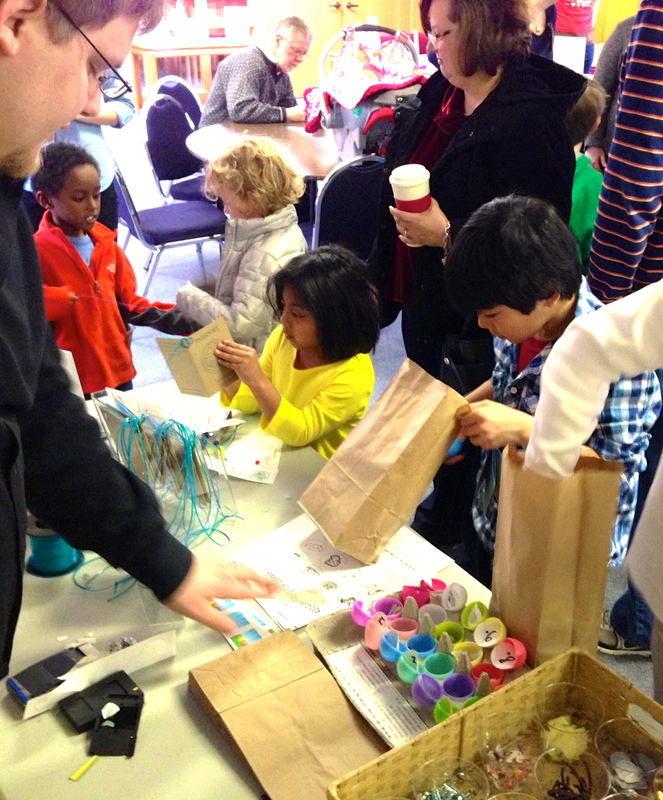 The Palm Sunday Fair activities were great fun, with stickers for communion bread baking, palm cross folding and cross beading, labyrinth walking, resurrection eggs, sacrifice beans, a food drive and poetry party, but the best learning will happen during Holy Week services. Those are the stickers we’re hoping kids’ take home. I’m attaching a modified PDF passport template for 2014, though there are many other excellent ideas on Pinterest and elsewhere for creating your own kids passports. Also, here is a holy week passport sticker PDF using Dan Erlander’s free artwork (see the link below for more great illustrations). Additional stickers were created using photographs specific to planned activities/events. I’ve edited out our church name, Palm Sunday Fair events and 2013 worship service times, and also added in 2014 dates so you can pretty much print, cut and assemble if you like. To keep the passports more authentically sized we trimmed them on the margins. 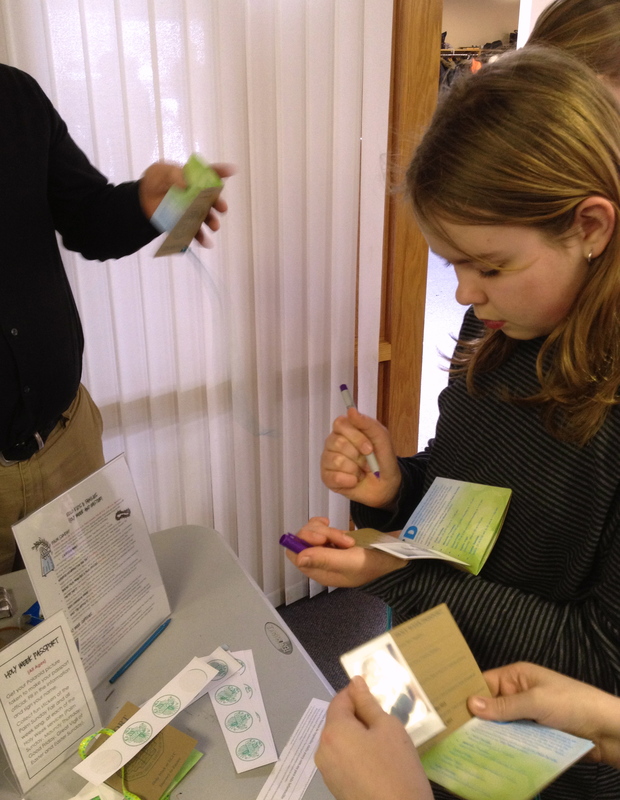 The passport stickers were printed on Avery 1-1/2″ round #8293 and the cover on recycled card stock paper. Because the cover is a big part of what makes the passports so awesome, you should know the design is borrowed from Dan Erlander’s free downloadable artwork and his copyright is printed on the back outside cover. During Lent we’ve been following his Manna and Mercy book, so it is a perfect fit. I love this idea and am using this for our homeschool during holy week. Am I able to get the stickers for the passport in a pdf file or direction to where to purchase. Thank you! I would love it if you would send me a copy of “Holy Week Passports for Kids and Families” It sounds like a great lent idea. I would love one as well. Thank you for asking! Happy to share! Hi Kelly, This is a wonderful resource you have created. Will you be doing a PDF for Holy week 2015? If so I would love a copy. great idea! i’ve used passports for VBS and youth ministry and I love this application as well. would love to have the template: ladypreacher95@aol.com thank you for sharing this! What a fabulous idea! I struggle with the Palm to Easter and children every year. I am a huge advocate on involving children in the entire week! My now 9 year old fell asleep at Good Friday service every year until last year, but he experienced the mood of it and part of it every single year….and I would not have had it any other way! Please email me your template. I am also the DCE at the church so am ready to add this next year! Thank you, Kristi! I’m so glad to be able to share resources. Would love to have the template also. What a great idea for learning! I would love a copy. I’ll use it for next year. 🙂 What a neat idea. I would love to use this nwxt year. Thanks for sharing! LOVE this idea! We are trying to include children and families in several Holy Week activities this year. We’re baking Communion bread Thursday afternoon and asking kids to help “strip” the altar at the service. I would love to have a copy of your passport. Thanks so much! thank you. I sent this link on to my email listing of lots of Christian ed folks, some in children’s ministry and others. I know it will help them. I also signed up to follow you. Love it! I would like one too! I’d love to hear what the kids do/experience during the rest of Lent that they use their passports for. Thanks-I love your blog! Can you please share the PDF for the Passport? Kelly, I would love to use a version of this for our children at Mulberry St UMC. The link to the template does not work for me, so I was wondering if you could send it to me in an e-mail? You are so creative! Question… I click on the link for the 2014 Passport Template, but Dropbox keeps telling me that the file is empty…. Am I crazy? Am I missing it somewhere else? I’d love to use this with my Sunday School students. Thank you! What a wonderful idea to share your idea with others. We would like to use it for our upcoming Lenten Fair for all ages. What did you use for stickers or stamps? That is the problem I am having to make the best use of the passports. I did not see it on the blog site. Am I looking in the wrong spot? The PDF links for both the passport book and 4 sticker pages is in the paragraph following the picture of the passport sticker book. If you click on these links the PDF files should open for downloading and printing. I’m sorry you’re having a hard time! Kelly, I know a bunch of people have already asked you for templates of the stickers, but I can’t find them on the blog. If you could tell me where to look or send them to my email address, I would love to use them. Thank you! I have one more question – is there an editable version of the passport PDFs? I want to add specific church events and times but can’t do so in the current format. I’m already very appreciate of you providing this resource in the first place, so if I’m asking too much, please don’t hesitate to say so. I meant to ask about the actual passport pages, especially the cover. For example, we don’t have an Easter Vigil, but will be doing an Easter Egg Hunt and Flower Cross. I’d like to be able to add the times of those events and our services if at all possible. If not, that’s okay, though. Kelly, thank you! We’ll be using Holy Week passports in the coming week here in Singapore. A great idea that is traveling around the world! We’ll introduce it in the children’s sermon this week, make them in SS class, and next week the Sr Pastor will have a special message for the children incorporating the passports. For those outside the US, Avery L3415 40mm round stickers (24 per sheet) work just fine with the pages template. Thanks again. Have a blessed Holy Week! Kelly, thank you! Just wanted to let you know we’ll be using Holy Week passports in the coming week here in Singapore. A great idea that is traveling around the world! We’ll introduce it in the children’s sermon this Sunday, assemble the passports in SS class after, and have a special children’s sermon for Easter Sunday to mark the journey. For those outside the US who have trouble getting the right labels, Avery L3415 40mm work just fine! Thanks again. Have a blessed Holy Week.